One the most fundamental principles of the work with others in Psychology is the notion of trying to understand the Other in his or her uniqueness. Some call this empathy but in a way is more than that. Empathy is the movement that starts in ourselves and that tries to acknowledge the experiential nature of the Other, on how they feel and how and why their emotions and feelings are presented. 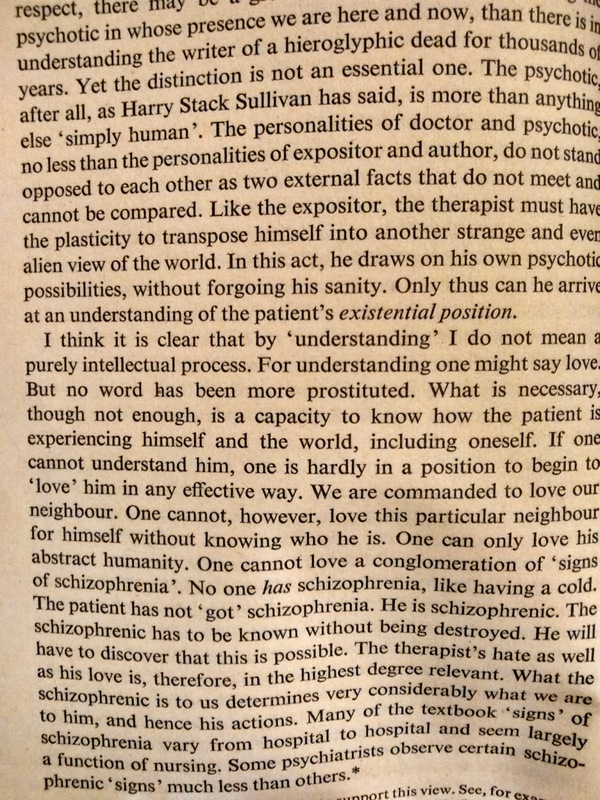 In the book from Laing (1965) about the existential analysis of sanity and madness, the author makes the point that underpins the existential and experiential studies of humanistic theories. 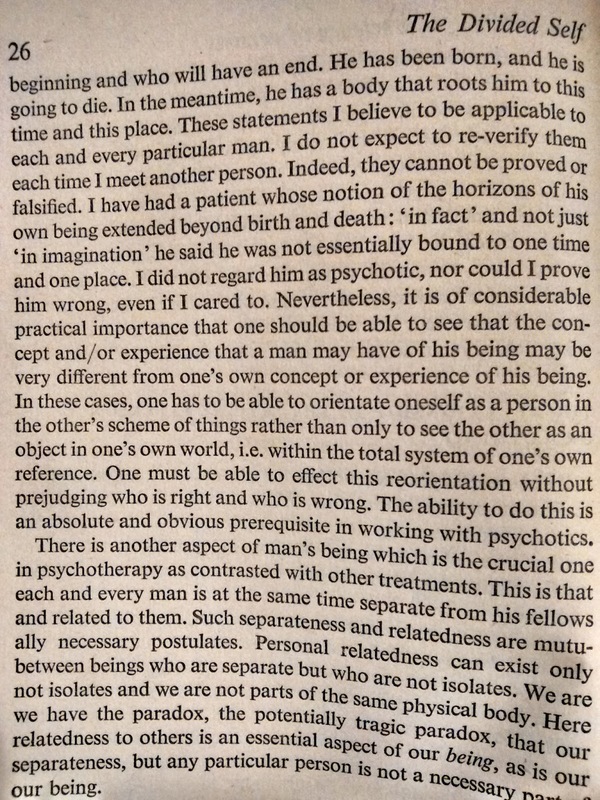 Laing draws our attention to the fact that (us who work with individuals in psychology or psychiatry) the Other should be apprehended totally and completely. This is not to say that they should be removed from their uniqueness, on the contrary. We should try to love the other person, love their lives in their uniqueness form and subtract. This means not to just be empathetic about their depression symptoms or their inability to write as well as other children do but, primarily, the individual and their complexity. This deceivingly simple argument yet powerful has the potential to transform do way we work. Loving the existence of another, or as I prefer, to apprehend their existence, is to not only be empathetic about their symptoms and guided by their signs but mainly to see them according to their uniqueness in the scope of their self-development. Several examples in my work as a Psychologist could be discussed. A simple one could be the case of a kid who doesn't engage in classes and doesn't care about marks or success. We can be empathetic about his life story and understand the pain that he experienced in his early years. We would also make notes of the signs, for instance, the lack of engagement and frequent externalising behaviours. We may identify speech and language difficulties or emotional and social interactions difficulties. They have our empathy. However, that's not enough. Either focusing on mental health issues or educational and learning difficulties, we need to take the Other in their existential position and to acknowledge that what separates us from them and also what unites us to them is part of the dialogical nature of existence. In that intersection, we are related but also isolated, although closely linked in the fabric of being. Going back to the example, this implies acknowledging the signs we see as part of the bigger picture that their existence is, where truth is the only fact, because uniqueness can't deceive. By apprehending the other, we could learn about the processes and experiential subtracts that made this kid to be who he is now and to frame signs as expressions of his uniqueness. This doesn't exclude working to help him overcome his difficulties in specific aspects of his learning but to see them as an intrinsic part of his being in the process of self-organisation. Apprehending the other is the process that allows you to identify and understand the complexity of the self and the nature of its different expressions. Laing, R. D. (1965). The Divided Self: An Existential Study in Sanity and Madness. Middlesex: Penguin Book, Ltd.
Television and video games are commonly seen as addictive and harmful when taken in larger doses. Parents and educators often question themselves about the right amount of stimulation that children receive when watching TV or playing video games. Teachers are often complaining about the volatility of attention and the short span attention, a characteristic of some children and individuals with attention deficits, that are believed to be linked to this new world of overstimulation and persistent connectedness to the digital world. There are some really interesting points in this discussion that should make us think about the relation of attention deficits, its disorders and the contextual factors that embodies them. First, attention deficits have to be taken into account concerning a particular background, frequently a task that the individual is trying to achieve, e.g., homework. We know that the longer periods of attention are hard, that being the reason why we usually make pauses during our work. However, attention deficits or alterations mean that the focus of attention is impossible to obtain or when achieved it's quickly lost. This leads the individual to lack commitment to the task at the hand and, this way, fail to execute. Second, attention deficits have an intricate nature of the rest of cognitive and emotional systems. This means that the lack of attention can be derived by normal stimuli in the environment (e.g., disturbing peer in the classroom), in the self and consciousness (e.g., worry of failure) and/or in a disturbed sense of lack of homeostasis (e.g., as in ADHD, primarily hyperactive, the inability to control one's cognitive and behavioural sense of motion). In consequence, the sense of loss of control dictates a response. Third, in the best case scenario, this will be reversed and the individual will be able to respond favourably, leading to the reasoning that makes the disconnection from the source of stimulation possible (e.g., the child turns the TV off), which in turn rewards the child with a sense of control over her actions and environment. It may also lead to an inner conflict that it is hard to resolve, on where the gratification of the immersive experience of the video game of the TV show is more enticing and prevalent than the voice of discipline and attention. This voice can be internal, eliciting an I-position (e.g., I as inattentive or I as bad student), or a position of an other (e.g., the voice of disapproval from the parent). However, it may be that this response is briefly considered in contrast with an alternative but in such a way that makes it almost irrelevant to the inner discussion, as it isn’t even valued as meaningful (e.g., I don’t give a sh*t about school, I do what I want, I always fail so what’s the point?). Fourth, there is a sense of wholeness to our experience in our existential configuration that makes respond to an imbalance with a sense of action. The learning cycles about the experiences of inattention and the ability to respond according to what is expected (e.g., focus on homework, do the chores) or to fail in that regard, in the large configuration of one’s identity, are so powerful that affect not only the initial problem of inattention – and consequently all the discussion around TV and video games, for example – but, more importantly, the place of the individual in his world. In an altered version of the CBT terms, the emotional, the cognitive and behavioural, consolidates solid beliefs in the individual, which in turn validate the assumptions that are made in the specific cases of inattention but, more importantly, the personal I-Self-O positions of identity. You have noticed that my focus was on inattention, as it usually seen as one of the most relevant implications of too much TV and video games consumption. I would add internet use, of course. It is important, nonetheless, to present the broader and related perspective of this relation to wellbeing. On the whole, after accounting for all of these factors, there were very few associations between electronic media use and wellbeing indicators. For girls, every additional hour they spent playing electronic games (either on consoles or on a computer) on weekdays was associated with a two-fold increase in the likelihood of being at risk for emotional problems – for example being unhappy or depressed, or worrying often. For both boys and girls, every extra hour of television watched on weekdays was associated with a small (1.2- to 1.3-fold) increase in the risk of having family problems – for example, not getting on well with parents, or being unhappy at home. A similar association was found for girls between weekend television viewing and being at risk of family problems. However, no associations were found between watching television or playing games and problems with peers, self-esteem or social functioning. It may well be the case that families who watch lots of television are not providing as much support for young children’s wellbeing from an early stage – so the association with television or game use is more to do with poor family functioning than the media themselves. Furthermore, the results don’t tell us anything about what types of television or genres of games might have the strongest effects – presumably the content of such media is important, in that watching an hour of Postman Pat will have very different effects on a four-year-old’s wellbeing than watching an episode of Breaking Bad. And as the authors note, relying on subjective reports from parents alone might introduce some unknown biases in the data – “an objective measure of electronic media use or inclusion of teacher or child report of wellbeing may lead to different findings”, they note. So the results should be treated with a certain amount of caution, as they don’t tell us the whole story. Nevertheless, it’s a useful addition to a now-growing body of studies that are trying to provide a balanced, data-driven understanding of how modern technologies might affect childhood development. Common sense is one of our most powerful tools and it is free. Parents are expected to regulate and supervise the consumption of TV, video games and the internet, as every immersive experience tends to glue the individual to a pleasurous context where immediate gratification occurs. Parental practices are, therefore, crucial to mediate a balance consumption of these contexts. Following on the last post about the abuse that has been made to the definition of ADHD, the article published on the April 2014 Monitor on Psychology by the American Psychology Association gives an interesting analysis to this serious topic and the explosion of the demand for ADHD medications. What exactly is leading to the growing number of new ADHD diagnoses? Is there a true increase in the disorder — or are we simply expanding our definition of it, or are more aware of it? And why is the chance of receiving an ADHD diagnosis twice as high in Southern states as in Western states? And more importantly, as it is said, like many other disorders, ADHD is assessed by a symptom checklist based analysis, where the criteria definition works perfectly for static realities. Well, in our real world, entities and their actions are much more fluid and complex, as presented in my last post. The importance of this factor is immense, as it underlines that nosological criteria have to be submitted to the spectrum analysis, which is to say that the limits of inclusion and exclusion are not so clear as the DSM, psychologists and other professionals tend to consider. The hard part is that ADHD is just like depression, just like autism, just like schizophrenia in that it's a symptom-based mental disorder. We don't have a blood test or a brain scan yet that's definitive. I believe that ADHD is a real condition, but it's on a spectrum, just the way that high blood pressure and autism are. It's always a bit arbitrary as to who is actually above the cut and who is below because we don't know exactly where the cut is. To prove that science does not exist in the void, the researchers made an interesting conclusion concerning the discrepancy of the rates of diagnosis of ADHD in the US. 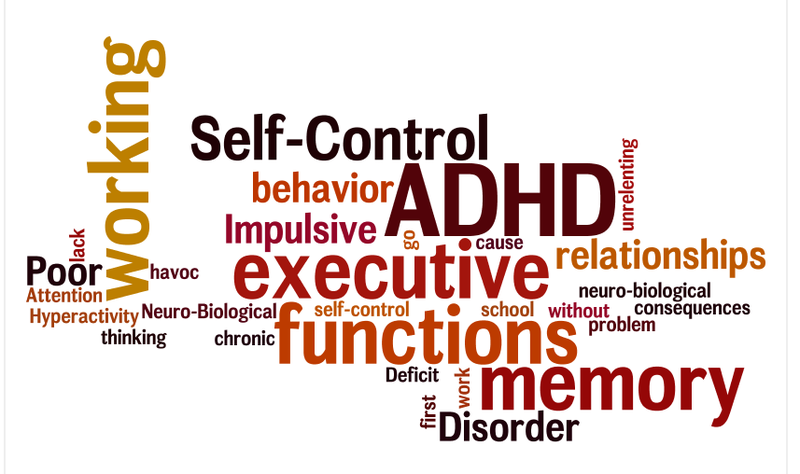 They came to understand that the more you focus on controlling the factors of performance - and the links that it has to the different levels of education in the society - the more professionals tend to diagnose ADHD. What we found was that standards-based education reform had likely played a large role in the nation's huge increase in ADHD diagnoses. Between 2003 and 2007, in those 20 states that didn't get consequential accountability until No Child Left Behind was implemented, we found a 59 percent increase in ADHD diagnoses among children who were within 200 percent of the federal poverty limit — so among the poorest kids in the state. Among middle- or upper-class kids in those states, there was only a 3 percent increase in ADHD diagnosis. That's a huge and statistically significant difference. Which lead to conclude that when test scores really, really count in the public schools, for the poorest kids in a state, ADHD diagnoses go up dramatically shortly thereafter. This means that teachers and schools are often tempted to use the diagnosis of ADHD when dealing with children that have very low performance, in order to justify why students fail to perform at the level that is expected. This doesn't mean that teachers and schools are the ones that are putting the stamp on the disorders and they are crucial in their information concerning the assessment process. This is also important because it gives a credible explanation to the proved signs of indiscipline and its relation to the underachievement of students. Having been in these situations, where the easy route is to take one of the most accepted and credible labels there is, it is important to be truthful to science and, more importantly, to the children and their uniqueness. I always recall to this effect, the case of a 8-year-old student that was taking Ritalin and failing at the school, showing signs of inattention, provocation with peers and impulsivity, which were in the outside great candidates for the credible - but abusive - justification of ADHD. One might even ask why he was already taking Ritalin - that falls off the scope of this post -, but the most important aspect here is that this student was going through episodes of Enuresis, Nocturnal and Secondary, according to the DSM-IV-TR. The approach, therefore, focused not on the signs of inattention and impulsivity but, more importantly, on the important signs of the mother-son dyad and attachment concerns that were negative patterns of self-other functioning. Cause vs symptom, map vs territory. Going to back our case that cultural norms and school policies have great importance in how ADHD and other diagnoses are made and used, the researchers affirm that school policies really seem to matter, in a way that factors such as ethnicity, medical professionals and culture don't. Can we say they're the absolute and only cause of these state and regional differences? No, but they sure seem to be implicated. There's also the whole issue of the use of medications for ADHD for people without ADHD. High rates of college students are taking stimulants, without any sign of having ADHD, and the short story is that stimulants are not as beneficial for cognitive performance for the general population as most people think. In those without ADHD, they may help you stay up later, but they don't really increase memory or learning. Importantly, if you don't have ADHD and you're taking these medicines as performance enhancers, there is also a much stronger chance you'll get addicted to the medication, and there are serious consequences of stimulant abuse. So it's another reason to take the diagnosis very seriously and not just dispense the pills if there's any small complaint of poor attention or poor concentration, because it can lead to serious trouble clinically. Assessments of ADHD are often very short and focused on the checklist assessment, which underlines a static analysis of behaviour, as separated from the individual and the ecology that he is part of. Therefore, instead of undergoing assessments that last 10 minutes or 15 minutes, professionals should understand how the symptoms play together not for the diagnosis of ADHD but in the large consideration of the child's uniqueness in the family and the context of life. It may be that at the end, the diagnosis is *really* ADHD, with predominant signs of inattention or impulsivity, but even if that is case, the label will be in accordance to a global assessment and the intervention will respond accordingly. This makes a very significant difference for children and their families. On top of everything, it is the right thing to do. It has to be at least several hours. You have to get observations from the school or at least ratings from the teacher, normed ratings from parents and a really good developmental history of the child. And we should focus on influencing the current tendency to dehumanise individuals by recurring quick analysis that completely miss the whole point of the assessment. But the national standard is for very quick diagnoses, which will certainly lead to over-diagnoses, because you can mistake all kinds of things for ADHD. But paradoxically, it also leads to under-diagnoses because some doctors will say, "He wasn't tearing up the waiting room," or "She sat very still in the office, so she can't have ADHD." Well, unless you see the child doing homework or when other people are giving directions, you'll miss it. Psychologists also need to understand this academic pressure that happens in the schools, and make their diagnoses carefully because they may be getting kids sent to them due to these pressures. Psychologists are the gatekeepers, and they have a lot of responsibility to look into this and make sure they take the time to look into the school, societal and parental pressures while doing a careful diagnosis. In addition, treating the kid without getting the family and the school involved is not optimal. The problem with an ADHD diagnosis is that it's a catchall for lots of things. It's hyperactivity, it's focus, executive function and the like, but usually the best treatment is to also consider involving the family and teachers in behavioral strategies to help improve focus, and to have everyone lined up to deal with this. There is no worse answer to a complex problem than to construe a simplified version of its reality and apply social constructions that create another reality that attempts to solve it. Expand this to an extreme and you have instruments that are very effective to dehumanise the person, in this case, our children. This article in the New York Times raises attention to the not-so-new tendency for the medical world to construct horrible nosological categories to identify behaviours that fit its own criteria, creating an illusion of a perfect instrument that finally captured the objective reality had been running way from science. However, we all know that reality is far more complex than we sometimes are lead to think. This is not a question of theories of conspiracy or evil doing to children but simply a clarification of how a paradigm gains its power through a very powerful minority and how that same minority is lead to believe that they are indeed paving the way of science. It is painful to see. This is just one of the examples that shows how the nosological categories established criteria that failed to truly grasp the problems faced by children. Although there are descriptors that attempt to address this issue, they do it to obliviate the problem, not to solve it. So anything we can do to understand what’s going on with these kids is a good thing. This is what should be at the core of the interventions with children and everyone else in the worlds of psychology, medicine, psychiatry, social services. The issue here seems to be that when you lose sight of the existence of the individual and his ontological uniqueness, the traps of objectivity lead you to believe that the map is the territory. It isn't, at all. Steve S. Lee, an associate professor of psychology at the University of California, Los Angeles, who serves on the editorial board of The Journal of Abnormal Child Psychology, said in an interview that he was conflicted over the journal’s emphasis on sluggish cognitive tempo. He expressed concern that A.D.H.D. had already grown to encompass too many children with common youthful behavior, or whose problems are derived not from a neurological disorder but from inadequate sleep, a different learning disability or other sources. Many problems identified as part of ADHD symptomatology should be first made intelligible in the context of the person and not on extrapolations to reifications of the self. This means that simple things like the lack of sleep, vinculation patterns that are anxiogenic or ambivalent, or a dysfunctional family, should be put at the forefront of the analysis, instead of jumping straight to the nosological categories that fail to take the most complex elements of life into account. About two-thirds of children with an A.D.H.D. diagnosis take daily medication such as Adderall or Concerta, which often quells severe impulsiveness and inattention but also carries risks for insomnia, appetite suppression and, among teenagers and adults, abuse or addiction. There is now a very solid understanding of the implications of medications in children. Now, imagine that those children have repercussions in their lives that causes intermediary effects that validate the condition that it is trying to address, e.g., how insomnia may lead to low energy and inattention and then to frustration, disenchantment concerning school and, consequently, to aggressiveness, as part of the signs of depressivity that sometimes plague adolescents. This is a cycle that I have watched myself happen in several interventions with students that were taking ADHD medications. An Eli Lilly spokeswoman said in an email, “Sluggish cognitive tempo is one of many conditions that Lilly scientists continue to study to help satisfy unmet medical needs around the world. The unmet medical needs of the world are, more often than not, signs of the major problem of creating alternative grids to read the world that have a vague link to the the world that it is trying to study. The unmet is also strangely related to the pharmacology of the problems and not so much to interventions in the context of holistic social services. The real world is a powerful evidence that doesn't tolerate oversimplification. The reductionism to the medical constructions of disease are not the answer, although very important to many cases. The case here is, however, to call attention to the efforts of dehumanisation of children and families and, consequently, to the wrong-doing of using medications to address problems that don't require them at all. One of the best metaphors to describe the neurological processing in dyslexia is the one of trying to use a fork (the right hemisphere) to eat soup (language processing in the left hemisphere). Most of the times, it doesn't work very well, that being the reason why people still use spoons to eat soup. It just makes sense. Individuals with dyslexia are often said to have their brains wired differently: they use the right hemisphere to compensate for the processing deficits in the left hemisphere. Interestingly, in children with dyslexia, the right hemisphere equivalent of this connection has been shown to predict reading outcome, consistent with the idea that the right hemisphere is used to compensate for faulty left hemisphere reading networks (Hoeft et all., 2011). The study here presented attempted to analyse the difference in language processing between adults with and without dyslexia, using machine-learning algorithms to decode handwritten characters combined with brain imaging solutions. What they found out was that individuals with dyslexia had significant impairments in the connections in the left hemisphere, which proved to be a sign of problems of access to phonemes. In this study, using neuroimaging technology, researchers investigated 23 adults severely affected by dyslexia and 22 adults without dyslexia. They found that the connection between left hemisphere regions that are important for processing speech sounds and speech output was impaired in people with dyslexia. They also applied machine-learning algorithms often used to optimize online search engines and to decode handwritten characters. Using these algorithms, they observed brain activation patterns in response to different types of speech sounds in adults with and without dyslexia. The researchers did not find differences in brain activation patterns in the accuracy of the algorithm between adults with and without dyslexia. This was in striking contrast to the connection impairment found in these adults with dyslexia. Based on these results, they concluded that it could be the access to phonemes that is impaired in dyslexia (based on connection impairment) and not the phoneme representation itself (based on no differences in brain activation). Or to put it in different words, this means that individuals with dyslexia have the same brain activation as individuals without dyslexia in the representation of phonemes but, contrary to the latter, the former have their brains confused on the routes to access the right phonemes to the visual cues that their brains receive. This is important because it adds a new note to the discussion: it isn't just the left-right hemisphere connection that is impaired but also the ability to access the phonemes. ....researchers found no indication that the neural representation of phonemes was abnormal in people with dyslexia. Contrary to many studies, the researchers found no differences in the neural representation of phonemes with individuals with dyslexia. However, others have found that phonetic feature representations are impaired in those with dyslexia. The debate between access and/or representation problems in individuals with dyslexia seems to be unanswered by this new data. However, this makes the debate far more interesting, as it seems that the brain has more complex ways to process language in individuals with dyslexia than previously believed. In Portugal, the last discussions about Education were primarily focused on the big system level improvements, which politicians and population think will allow the students and teachers to improve their performances significantly. "(These) simple changes produced a larger effect than the average improvement for classroom interventions that require a complete overhaul of curricula and/or teaching methods." However, we know that when we discuss Education we are looking at a major intricate novel where complex characters coexist. Downstream, students are the often called recipients of learning or the agents that will change the economy, societies. There is some truth to that if we change the wording but, at the end of day, the purpose of everyone is to have better schools, better communities, a better future. But way more than that, we want to have happy students in the process of learning, able to make a positive contribution in their communities and, more importantly, in themselves. The learning process demands salient abilities and psychological and emotional harmony from students, pre-requirements of an educational development that intersects with the self-development. The process of learning has been thoroughly studied and findings of cognitive science have allowed us to identify some strategies that improve this process. "Based on laboratory studies, we know a lot about how people learn," said lead author Andrew Butler, a postdoctoral researcher at Duke. Repeated retrieval practice -- In addition to receiving the standard homework assignment, students were given follow-up problems on the same topic in two additional assignments that counted only toward their course participation grade. Spacing -- Rather than giving all the problem sets for a week's lectures in one assignment, the researchers spaced the problems over three weeks of assignments. Feedback -- Rather than waiting one week to learn how they did, students received immediate feedback on intervention homework, and they were required to view the feedback to get credit for the assignment. Repetition, retrieval, and expansion of knowledge; segregation of parts of problems spaced over time; and immediate feedback. This means that the learning process was focused on dilating the period of intensive learning, on the consolidation of learning, allowing in this process for enough time to reflect upon the material learned and immediate feedback to ensure that students review what they have learned. "Giving students multiple opportunities to practice retrieving and applying their knowledge on new problems is a very powerful way to promote learning, especially when this practice is spaced out over time,"
Feedback also is critical to learning, and previous studies have shown that students will often skip looking at feedback." The researchers split the class into two groups and assigned each group standard homework and intervention homework during alternating weeks; in any given week, half of the students were assigned to the intervention and half to the standard practice homework. The course covered 11 broad topics and approximately five core concepts per topic. Questions on the midterm and final exams covered specific concepts and topics, so by comparing how the two groups fared on those questions, the research team could compare whether students learned more doing one style of homework or the other. The research showed that students scored about 7 percent higher on the portions of the final exams that were taught with the intervention. As mentioned in the article, it was hard to control the variables of extra-study at home or any other measures taken by the students to improve their outcomes; however, there seems to be a positive impact of these principles in the learning outcomes. At this point, if you are teacher, you'd say, well, I already do this with my students! and yes, you probably right, as some of the principles here are very common in our schools. Nonetheless, this study is important because it helps us review some major principles that we sometimes tend to forget or, because of the frantic nature of classrooms and schools, to neglect. As the authors point out, these principles can be used in other contexts and grades. Based on previous working experiences with individuals that were using psychoactive/stimulant drugs, like methamphetamine, it is not hard to see how their psychological and physical degeneration would cause their babies maleficent consequences. What struck me the most about the use of meth, oxy's and benzo's, although in different categories, was its impact when used for prolonged periods of time. The states of confusion tended to become frequent and the cognitive functions impaired. Among the cognitive aspects, the process of decision making becomes blurred, the speech becomes equally confusing - language is though put in words, right? -, attention and concentration are severely reduced, and self-other patterns gravitated towards conflicts and attrition. For delusions this is fertile ground to flourish. If you take these scenarios and imagine them as consequences of drug induced brain damage and physiological craving for failed homeostasis, then the consequences to the fetus would make sense. That seems to be the case. Methamphetamine use among women of reproductive age is a continuing concern, with 5% of pregnant women aged 15-44 reporting current illicit drug use. Methamphetamine usage during pregnancy can cause a restriction of nutrients and oxygen to the developing fetus, as well as potential long-term problems because the drug can cross the placenta and enter the fetus's bloodstream. This in turn has a very significant impact in the harmonious development of children. "These problems include learning slower than their classmates, having difficulty organizing their work and completing tasks and struggling to stay focused on their work,"
it's not only about the drugs; it is also about the rituals and the alterations of the dynamics in the family setting, which, more often than not, with couples or single mothers that are users, becomes something like a roller coaster between isolation (fear, anxiety) and the life of the pack (the you's like me). This leads to patterns of self-organisation based on insecurity, fear/anxiety, suspicion, paranoia, poor decision making, reduced attention to other parts of the self outside of the equation of craving vs self-preservation, and a striking inability to understand the world of others and their place in it. The early context of self-development is experienced by the child in very specific contexts and it surely depends on the impact and self-other regulation processes that significant others had during infancy. The baby that became child that became adolescent is an ontological unique identity. As such, he has to be listen to, understood, empathically embraced as someone that can change. Anger and sadness, with pervasive signs of depression are very common among adolescents - adults tend to experience more sadness than anger or rage. Emotional intersects with psychological and cognitive. Continuous use of drugs should be checked in the family, as well as abuse and violent patterns. I always think about one 18 year-old that had so much anger towards his father that his words and non-verbal screamed for (self)destruction. Resources in the child, the family, the community and social agencies have to be made clear. Do not reify drug type entities and stigma in the child or the family. Most of the times, these individuals would like to change their lives but to initiate that process is tremendously hard. Imagine changing your life and self completely is nothing short of a big challenge. These are just some notes about the pre-stage for strategy design and subsequent implementation. I believe this stage is of crucial importance, as it will determine if the child and the family become open to be authors or mere spectators of a failed intervention. Specific measures of intervention in specific areas should then be designed according the areas of impairment or in need of development, solidly anchored on an holistic view of the child. "By identifying deficits early in the child's life, we can intervene sooner and help them overcome these deficits to help them have greater success in school and in life," said Dr. Smith. "Through the IDEAL Study, we are able to track these children and better understand the long-term effects of prenatal methamphetamine exposure."